How Risky Is The Procter & Gamble Company? The household-products giant is well known as a low-risk stock, but it could have more downside potential than you think. As a 179-year-old diversified producer of household products, Procter & Gamble (NYSE:PG) is often regarded as one of the most risk-free stocks on the market. It's a Dividend Aristocrat to boot, having raised its quarterly payout for 60 consecutive years, and now offers a healthy dividend yield. Selling product like soap, laundry detergent, and razors that are as timeless now as they were a century ago, the company seems to have a business built to last. P&G may, therefore, look bulletproof -- but looks can be deceiving. Longevity is no guarantee of future success, as we were reminded earlier this month when Ringling Bros. and Barnum & Bailey circus said it would fold up its tent after 146 years in business. Pressure from animal rights groups forced the entertainer to cut out elephants from its performances, and attendance sunk without them. Digital entertainment options that existed a generation ago like iPads and Netflix also likely hastened the circus' demise. The Tide-maker may not be facing such an existential threat, but the competitive landscape is changing in its industry. Here are a few of the risks investors should be on the lookout for. The internet has upset the traditional order in retail. It's created opportunities for upstart brands such as eyewear-maker Warby Parker to challenge entrenched brick-and-mortar chains, and Procter & Gamble's biggest brands have also been affected. Razor-maker Gillette has seen heady competition from online brands like Dollar Shave Club and Harry's. Dollar Shave Club's success led Gillette to roll out its own subscription-based membership program, and Gillette even sued Dollar Shave Club for patent infringement in 2015. Launched in 2012, Dollar Shave Club helped cut Gillette's North American market share from 71% to 59% in the intervening years as the start-up built up a membership base of 3.2 million and was bought by Unilever (NYSE:UL) for $1 billion last year. An even bigger threat to P&G may come from Amazon.com (NASDAQ:AMZN), the great disrupter of this era. Reports emerged last year that the e-commerce giant would begin making its own private-label goods, including diapers and laundry detergent. With tens of millions of Prime members in its ecosystem, Amazon has a ready-made legion of trusting customers that it could likely cut off from P&G if it chooses to make quality products and undercut it on price. Procter & Gamble was once a hallmark of American innovation, as it was a pioneer of products like laundry detergent, fluoride-based toothpaste, and disposable diapers, but its innovation pipeline has dried out in recent years as the company has spent a smaller proportion of its revenue on R&D. Its latest major invention was the Swiffer, the floor-cleaning system with disposable pads, which it launched in 1999. The company's response to Dollar Shave Club may best illustrate its attitude toward innovation these days. In 2014, Gillette released the ProGlide FlexBall razor with a retail price starting at $11.49, though its only enhancement was a track ball to guide the razor, and planned to spend $200 million marketing the new product. In other words, the bulk of the product's budget seemed to go to marketing, rather than innovation. Gillette later created its own shave club, but its response to the start-ups has been generally weak. It could have just bought Dollar Shave Club, but the company has been so focused on shedding brands that it may be missing opportunities. Perhaps as a consequence of e-commerce threats, a lack of innovation and a stronger dollar, Procter & Gamble has seen its growth slow significantly in recent years. In its most recent report, organic sales increased 2%, though investors sent the stock up as it raised its full-year organic sales guidance from 2% to 2-3%. The stock's performance has also been underwhelming in recent years, as the chart below shows. 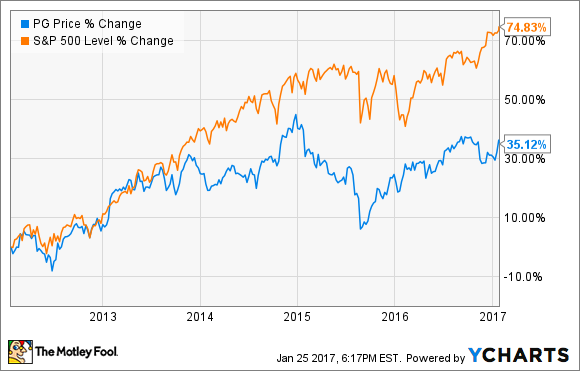 As a defensive stock, it's worth noting that P&G may be more likely to outperform the broader market during a sell-off. Perhaps more importantly for dividend investors, the company's dividend growth has slowed dramatically. In the last two years, it hiked its dividend by 3% and then just 1%. With a payout ratio of 73%, the company has some room to raise its dividend faster than that, but without significant increases in earnings growth it will be hard for the company to beat low-single digit increases. Ultimately, what defines risk for an investor is the chance of losing money on a given investment. With its solid dividend payout and stable of diversified brands, investors can probably count on a modest return from P&G in the coming years, but its recent underperformance against the S&P 500 is a lesson. Even for investors looking for low-risk stocks, there are probably better places to put your money.